It’s been a long time since we’ve captioned a photo! 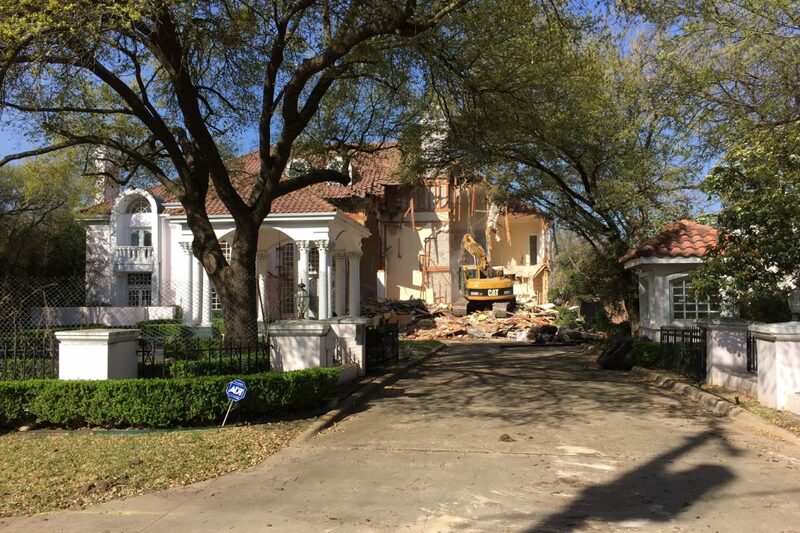 Mary Kay Ash’s former home is being torn down, and I though the picture of it meeting the wrecking ball might inspire some funny captions. The 11,874-square-foot mansion, located at 8915 Douglas Ave. in Old Preston Hollow, was built in 1984. According to Dallas Central Appraisal District records, the home is valued at $1.91 million. Its desirability is listed as “very poor. Was listed at 2.8 million in 2012 … at one time, the mansion was listed for $5.7 million. And now it’s a tear-down. What was she thinking with 40-foot ceilings! Breaking news: work on tearing down the former residence of the Queen of the Beauty Products empire was stopped unexpectedly when workmen noticed mysterious objects hidden inside the walls. Police are investigating. Headline: Mad ebay bids from kbots over the heart shaped tub! Headline: Kaybots from around the country gather at MKs home during the evening and sang “Mary Kay Enthuiasm” slowly and somberly with lifted cigarette lighters lit and uplifted. I looked it up on Google Earth and as of a year or so ago the pool was greenish brown! It doesn’t matter how wealthy you are, if you have taste it shows, if you have NO taste it REALLY shows! It should be likened to a crime scene. This is where a forty year old began an empire using the exact same tactics she supposedly detested during her own sales career. The amount of deception including the fake dual marketing and the lawsuit with Jackie of beauty control are just the tip of the iceberg. Too bad this home could not have been donated to charity before it was left to ruins. An example of another hypocritical empire imploding. Thousands of women’s lives ruined while they bee-lieved in this fable of a tacky, mlm, cultish pyramid scheme designed by narcissistic predators. Women abusing other women with fictional stories of caring, concern, having it all and executive income. The Faith, Family and then career slogan and this house drew us in. Tearing it down shows the end of an era. Once the son is gone, more debt will more than likely be revealed. Another alternate reality. I do have to say that it’s a shame that the interior finish work was not salvaged. Some of the craftsmanship is quite good. No one showed up for the Mary Kay skin care classes booked all in advance…….year after year of no shows and here you are. Where will all the bumble bees roam? People change and even products change. But over the course of time it’s the strength of a company’s philosophy that will determine whether or not it endures. I wish I could have been behind the controls of that wrecker! The consultant who sells the most gets a piece of the house where mary kay lived!! You can do it!! Shoot for the stars! !